Feed a Smile: Only a few more hours! 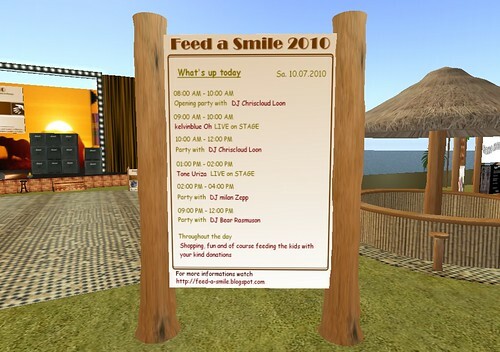 Now we start to get excited, only a few more hours and the Feed-a-Smile Charity Event will open the gates with a big party. Please join us at the venue and let us have fun together after all that hard work. We have put together this event in only 6 weeks from the first thought up to the opening party. I never thought really it would be possible and I still would love a few more weeks. The few bloggers and publishers we have had have been wonderful but we still feel the event needed to be out there more in the way of advertising and promotion. We would have loved to have had more members up on the venue to guide our visitors but the hard working Feed-a-Smile Team we do have will be there to help whereever we can. By saying hard working, I would like to mention Mellificent Juneberry in particular. She is the fashion show coordinator and has built up 5 big shows for the event and is still working very hard to this moment. Through it all she has kept her humor and you can see she really loves her work. This love you will see and feel when you watch the shows and keep in mind, everyone provided their time and work for free. But back to the big opening. What can you expect today? Well here is a photo of the event plan for today. Looking good? So please come over and have fun and while you are here, please help put smiles on the faces of the LLK project children by purchasing something from our top designers donation vendors or by donating in one of the donation boxes on the venue. We are looking forward to see you on the venue and saying a big hello.